Scott Brosius, Head Baseball Coach, class of 2002, reading Coach Wooden's Pyramid of Success: Building Blocks for a Better Life, by John Wooden and Jay Carty, and Jackson Vaughan, Head Softball Coach and Assistant Football Coach, class of 1997, reading The Winners Manual: For the Game of Life, by Jim Tressel, with Chris Fabry. 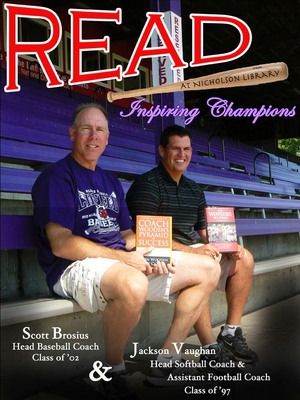 Terry, Paula and Nicholson Library Staff, "Scott Brosius and Jackson Vaughan READ Poster" (2010). READ Poster Gallery. Image. Submission 79.